"THE MORMONS RETURN TO PALMYRA"
by Travis Glenn Haws, Ph.D.
"The following is an account of some of the missionary experiences of Willard and Rebecca Bean during their 24 year mission to Palmyra, New York, during which time they lived in the Joseph Smith house on the Joseph Smith farm. Willard Washington Bean was born May 16, 1868, at Salt Lake City, Utah. He was the 7th child of George Washington Bean and Elizabeth Baum. Willard’s wife, Rebecca Rosetta Peterson was born in Richfield, Utah, the 10th child of Ole Peterson and Julia Hansen. They were immigrants from Denmark. Willard and Rebecca were married in the Manti Temple on September, 18, 1914. This is their story as told by Rebecca at a fireside held in Salt Lake City in 1964. At the time of this talk she had been a widow for over 15 years and passed away on June 15th, 1976. I have used excerpts from their inspirational story many times in my Institute classes and would like to share it with you, the reader." "It is hard to do sometimes . . . to give a talk when there are missionaries present . . . . they are all good speakers and I am not a good speaker. So I will just reminisce a little bit. But I always speak with a prayer in my heart, and I pray that what I say this night might be interesting to you. All my life I have loved the Prophet Joseph Smith. My mother told me all about him when I was a little girl, and she also used to tell me about the missionaries too; so I grew up with a great love for missionaries. They came to my parent’s home in Denmark. They joined the church and came to this country as pioneers. And so I thought a lot about the missionaries and about the Prophet Joseph Smith when I was a little girl and came to have a great love for them. Oh how I wished that I had been born out in the world so that I might have missionaries come to my home because there were none in our all Mormon town of Richfield. I had no way of knowing that I would have missionaries come to my home . . . . more missionaries than any woman in the history of the church. In 1907, Elder George Albert Smith of the Twelve was able to buy for the Church, the Joseph Smith farm from a Mr. Chapman. Before the purchase he visited the old gentleman every time he went east and they became pretty good friends. Finally the old man decided that he would sell the farm to the Church, and the Church was very, very happy. They had been wanting it for a long time so that they could do things there, allowing our people to visit the place and really enjoy it. Before he sold the property to the Church the owner asked if he could stay on for a while until he found another place that suited him. The Church thought it would be only for a short time and they said that would be alright. But instead of a few months, it stretched into years before they could get him to move out. Every time they talked to him he would say, “I still haven’t found what I want and you said I could stay until I did.” Six years went by and then a letter was received from him saying that he would have to give up the farm because he was having problems with the hired men. Then the thought came to President Joseph F. Smith, “All this time has passed and we haven’t given any consideration about who to send out there to live on the farm. He knew it would have to be a humble man, a fighting man and a man who could make friends and who knew the Gospel. And so the General Authorities thought about it and prayed about it. This was in 1914. We had been married in September of that year. Shortly after our marriage President Smith felt impressed to go to Richfield for a Stake Conference. He had wondered why he had been called by the Spirit to go down there. I came into the church and went up to the choir seats while my husband, Willard, came a little later through a side door. The moment he stepped into the hall, President Smith stood up to the pulpit and said, “Willard Bean, please come to the stand.” Then he said, “Willard, I’ve got another mission for you! After this service is over I will tell you all about it. When you stepped through that door the impression was so strong it was just like a voice saying to me, ‘there’s your man!’ ” So that is how we were called to go back to Palmyra, the place where holy men have walked, the place where God with man has talked and where our prophet lived for many years; a place where he suffered much persecution and where he lived and loved as a young man. It was in late 1914, that we went to the office of President Smith to be set apart as missionaries to come out to Palmyra. They warned us that we would find it to be the most prejudiced place in the world. But then President Smith said, “Willard, knowing you and your missionary work and your fighting spirit, I am sure that you are the right man to send.” He was right . . . . when we arrived in Palmyra they were waiting and ready for us because they knew we were coming. There was not one person who would speak to us or even look at us. They had made up their minds not to have anything to do with us. After we moved in, the people in Palmyra held a meeting. That same night there was a knock at our door. Willard opened the door and three men stood there, Willard said, “Won’t you come in?” And one said, “No, Mr. Bean, you step outside!” And then he said, “Now we have just come from a town meeting and we are a committee that has been sent out here to tell you people that we want you to leave Palmyra. We don’t want any Mormons here!” And then Willard said, “Well, now, I am sorry to hear that. We had hoped to come out here and settle down with your people and be an asset to this community, but I’m telling you, we are here to stay, even if we have to fight to stay! So I will take you on one at a time or all three of you at once, but we are here to stay!” Well, they turned and ran away and we never heard any more from that committee. I ought to mention that my husband was a professional boxer. And you know, that came in handy all his life. I will tell you more about that in a few minutes. I remember one incident soon after our arrival. Willard had gone into town to buy a few things that we needed. He waited and waited until finally a clerk came to wait on him. Willard just stayed in the store until they did. Later he was walking down the sidewalk past a lovely home where a man was watering his lawn with a hose. The man saw Willard and he knew who he was, of course, and he said to Willard, “I understand you people believe in water baptism,” and he turned the hose on Willard. And then Willard said, as he quickly jumped over the fence, “We also believe in the ‘laying on of hands! !’ ” The man dropped his hose and ran into the house. Willard was a wonderful man and had a delightful sense of humor. He always had the right answers. So that is the way things started out in Palmyra. Soon I was expecting our first baby and I contacted three or four nurses but not one of them would agree to come. They all said they would not go into a Mormon home. I was worried and I prayed about it. One day a lady came to the door. She lived on a farm not too far from us and she said, “I understand you can’t get a nurse to come and stay with you when your baby comes.” I told her that I had contacted several but none would come.” She said, “Oh, I am not a trained nurse, but I have helped in a lot of cases like this and I am not afraid to come. My brother went to Salt Lake City just for curiosity and he liked it so well that he stayed out there. He tells me that all these awful things we have heard are all lies and I am willing to take his word for it.” She stayed with us for three weeks. When the baby came it was a little girl and we named her Palmyra. I sat down in my rocker (my baby had dropped off to sleep) and meditated about what had just happened and this wonderful feeling that had come into the room and the knowledge and feeling that I had that someone stood beside me and helped me. And again I say, after that, I knew the Prophet Joseph Smith and I felt his love and his influence all the years that we lived there. Even my little children felt it. To us he was Joseph and when they spoke of him they said his name tenderly. They grew up learning about the things that happened there and after they got older, they could take anybody through the house or to the sacred grove. They could take them to the hill and tell them all about it, talking just like grown people would because it had become a part of their lives. Things went on that way and we had more and more visitors. It was such a thrill to have the missionaries come because I had such a great love for missionaries. I realized that when we moved to Palmyra and the missionaries came that it was the fulfillment of the desire of my heart as a girl to have missionaries come to my home. The evenings when they were there were wonderful. We would sit on every available chair and on the floor and listen to things my husband had to say. It would take a lifetime to tell all the things about his life and our experiences there. I will only be able to touch on a few tonight. I would like to mention that Willard knew many of the General Authorities all his life. When he was just a boy in the summer he and his brother herded and took care of cattle for the Church down on the hillsides of Richfield. In the fall they would drive them back to Salt Lake City. They would drive them on the roads that existed at that time and sleep on the ground among the cows at night. So they knew many of the the leaders of the Church. One time when the Presiding Bishopric took a trip south they came as far as Richfield and then came to Willard’s father and mother and said, “Now we were told that Willard Bean would make a good teamster for us . . . . a good boy to handle the team and take care of things for us.” So they offered Willard the job. He drove a white top buggy for them. They each had a bed roll. Between settlements, they slept out under the stars at night. They cooked their food around a campfire and you can just imagine that a young man like Willard would certainly learn a lot about the Gospel and gain a wonderful testimony. They were gone the better part of a year, visiting all the outlying wards and branches of the Church clear down into Mexico. He hadn’t been home too long after they returned until he was called to Manti to be a worker in the Manti Temple and that was before he was 18 years old. Now being very athletic and very strong, he did a lot of the baptizing there. I have been told that he holds the record for baptizing the most people in one session of anyone in the church. On this occasion he had done over 600 baptisms and then the mail arrived with a letter from Salt Lake saying that another 500 needed to be done because they wanted to start work on them right away. So without getting out of the font he did 500 more, making a total of over 1100 all at once. When he finished they told him, “Now Willard, you can take the remainder of the day off. Get something to eat and rest. You have had a big day!” So he had his dinner and then played baseball all afternoon. After his work at the Manti Temple he went to Brigham Young Academy and that is where he did a lot in athletics. He excelled in everything he did, but he liked boxing better than anything else and decided that he wanted to be a professional boxer. His father and mother told him to talk to the Church leaders about that and if they said it was okay, then it would be alright with them. The Church Authorities said, “Ordinarily we would say no, but with the knowledge you have of the Gospel and your friendly way and all, we think you will be able to do much good by being a boxer. When you mingle with different people and they see what kind of life you lead you will be a great example of a Latter-day Saint. So you just go ahead and it will be alright.” But oh, some of them did want so much to go and see him box but in those days they didn’t do that kind of thing. One of the Apostles told his son, “I would give anything in the world if I could go see Willard box tonight.” His son said, “You can, Dad. I’ll fix up a disguise for you and we won’t sit together. I don’t know if he went but Willard won his fight . . . he almost always did. 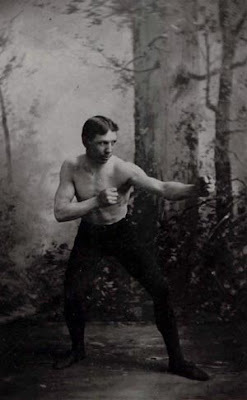 When Willard went to the Southern States on a mission, George Albert Smith was one of his companions and boxing came in very handy there. One day three big bullies were coming down the sidewalk and when they got even with Willard and his companion one of them said, “We are going to beat the hell out of you!” (Excuse me but that is the language they used) Willard said, looking them in the eye, “Of course you will allow us to defend ourselves, won’t you?” They laughed and said, “Imagine that . . . . preachers fighting back . . . . of course you can fight back!” Willard hopped around a little bit like he didn’t know what he was doing and like lightning landed a blow on the chin of one of the men and knocked him out. The other two looked down at him in amazement and then turned and fled. Willard and his companion helped the poor fellow until he regained consciousness. They sat there on the sidewalk and talked to him. He wanted to know all about how Willard learned to box and everything, so they told him about their message and he became a good friend after that. There are many, many other stories that I could tell you about my husband. In fact, it seems every ward I visit there is someone knows another story about Willard Bean. Getting back to Palmyra . . . . the time came when the Church was anxious to have the Hill Cumorah. We had the Joseph Smith farm with the Sacred Grove and our people were so happy to be able to come there. The first time we ever went to the hill we tied our horse and buggy to a post and started to walk up the hill. A man came came running up to us with a shotgun and said, “Nobody steps on this property who belongs to the Mormon Church!” Willard said, “Do you own it?” He said, “No, but I work here and you can’t go up there.” So we just looked at it and came home. And that is the way we found things there. It took about five years to begin to break through the prejudice . . . five long years. When we were first called on our mission to Palmyra they said it would be for five years and at the end of that time I began to hope that we could stay a little longer since a change was beginning to come over the people. Our desire was to stay on and see if we could make some friends there. Five years came and went and nothing was ever said about releasing us and we just stayed on. We had made some friends in the farming area around us. They did not seem to be afraid of us anymore and we could talk to them. The first step in gaining ownership of the hill came when Willard was able to purchase for the Church a 98 acre farm from James Inglis which included the west side of the hill. We now had a place to park and could climb half way up the hill on our own property. So what happened after that was strange. Mrs. Sexton died, and then two nieces passed away that would have inherited all his property. And then an old gentleman that shared a lot of his property with him, that lived and helped him in the bank, he also passed away. Finally Mr. Sexton became ill and he passed away. The lawyer that handled his estate was a good friend of my husband. At this very time the Church wrote and said, “Elder Bean, is there a chance we are getting any closer to getting the hill?” At the same time Willard had written Salt Lake saying, “It looks like we are getting closer to getting the hill.” He told them how many had died and that Mr. Sexton was ill. Those two letters passed each other in the mail. By the time the Brethren received Willard’s letter, Mr. Sexton had passed away. The lawyer called Willard up and said, “After this is all over you come and see me. There is only one niece and she is Mr. Sexton’s only heir. We will see what we can work out.” Mr. Sexton owned the four remaining farms that bordered the hill and a rather new Grange Hall there which Mr. Sexton had taken back because the Grangers couldn’t pay for it. It was worth $10,000. We thought it would make a fine chapel for us. The niece told the lawyer, “If they will take the four farms and the Grange Hall, I will sell it all to them.” The lawyer then told Willard, “She is willing to let you have all of this for $53,000.” There was over 283 acres of land, including the hill and the building. And so that is how we acquired the Hill Cumorah. And of course, it did not take very long to make all the arrangements for the purchase. After the property became ours, Willard wrote Salt Lake and said, “the hill was covered with trees at the time the Prophet received the plates from there. It is now bare. If you would like it reforested, I am sure it can be done.” The Brethren wrote back and told him to contact a nursery and see what it would cost. A nursery near Albany, New York, was contacted and they said, “If it is for reforestation the trees are free. You just have to pay for the freight to get them there.” And so they sent 65,000 little evergreens, seven different varieties. We also dug up 3,000 little hardwood trees that were growing up along the fences and road sides from seeds and roots, and planted them amongst the evergreens. You can’t imagine how many people we had to hire, besides all the missionaries we could get, to plant all of those little trees. If any of you have been there you know what a mighty forest there is on the hill now. Of course they had to remove some of them to make the stages for the pageant and top some of them that were too tall. And so things slowly began to start working out beautifully for the Church in every way out there. We had a few friends and had a few converts. We had a little branch there by this time. We had first a Sunday School and Sacrament Meeting, then Primary, Mutual and finally a Relief Society. I had the honor of being the first Relief Society President. There were only five of us but we still met for Relief Society every week. The man who was in charge of the county welfare work, called the Poormaster, was willing to work with us. He would come to us and say, “I need a layette and a few things for a baby that is coming and we haven’t anything like that in our storehouse”, or “I need a quilt” etc. He told us, “If you will help me out, then you can come to the storehouse and get anything we have that you need or want.” So we felt very good to be working with him. So we were very happy after a few hard years to see things changing the way they were. And of course more and more of our people came. One of our missionaries, Norma Fairbanks, wrote the first little pageant that we put on in the Sacred Grove. Just a few missionaries were in it. By that time I had three children: my daughter Palmyra, my son Pliny and a son, Don. Pliny was eight years old at this time. Even though he was a little young they asked him to play the part of Joseph Smith in the pageant. He said he would have to think about it. They asked him why. All he would say is that he had to think about it. Pliny came to me and I asked him, “what is there to think about? It is a great honor that they asked you.” Again he said he had to think about it. Finally he said, “Well I’ll tell you mama . . . if I don’t have to see an angel, I’ll do it!” So even though he was that young he even had a little fear because he knew of the reality of things that had happened there and did not feel equal to it. I remember when Palmyra was to be baptized. Elder James E. Talmage of the Twelve happened to be visiting with us. Willard baptized her and I have a lovely picture of that sacred occasion. There were hundreds people there for a conference we were holding. We dammed up the stream in the pasture in back of the barn (that is where some early converts were baptized) so that it created quite a nice pool to use for baptisms. There were several others baptized that day. I asked: “Elder Talmage, will you confirm Palmyra? I think that would be something special for her to remember and she would be so very pleased.” He looked at me for a moment and he smiled and said, “President Heber J. Grant will be in charge of the meeting. I hate to make any suggestions, but let’s you and me pray about it,” and that is all he said. And sure enough, the next day when they were confirming those that had been baptized the day before, President Grant said, “I think we will have Elder Talmage confirm little Palmyra Bean.” Elder Talmage smiled at me as he stood up and I know that he had prayed about it too. We were there when we had the first pageant at the hill. It was written by Oliver R. Smith, one of the missionaries. Don B. Colton, the President of the Eastern States Mission was the one who told him what he wanted in the pageant, and of course by that time we had other people in the area who had joined the Church. Things in our area were really starting to improve and be wonderful. When they had the pageants a lot of missionaries stayed with us. During the day they had meetings and fast and testimony meetings. Each missionary was given a chance to bear his testimony in the Sacred Grove. You would have to be there to know what it means to bear your testimony in that sacred place. Some of the General Authorities were always there and the mission president. One by one those sweet, humble missionaries would get up. With tears streaming down their cheeks they would thank their Heavenly Father for their parents, for their teachers that had taught them in Sunday School and Primary, and for what they had learned in the mission field while they were teaching the Gospel to other people. This experience was wonderful for me and my family. These meetings would last all day, not just two or three hours. And oh, the wonderfulness of those young missionaries to come and stay a couple of days with us when they were released and before they returned home. They would stay with us and would spend time over in the Grove or up on the Hill Cumorah. They would just linger with us for a couple of days and partake of the spirit of those sacred places. You can only imagine the good feelings that they had to take home with them. As time went on, more and more people did join the Church . . . . but not many from Palmyra. They still had it in their hearts that their grandparents were truthful when they told them how awful the Prophet and his family were and they believed it. At one point we began holding street meetings in Palmyra but not until we had been there more than five years because before that they would not have allowed it. I had a baby in a buggy and would stand on the street corner with my husband and the missionaries. Sometimes I would sing alone and sometimes with the missionaries to help attract a crowd. My husband and the missionaries would then talk to the people. If anyone had told me as a girl that I could do a thing like that I wouldn’t have believed them, but in the mission field you get the spirit of it so that you can do anything that comes your way. I have spent so much time with the missionaries and partaken of the spirit that they have, that my prayer has been answered that I would have the spirit with me always and that it would be my life. And I believe it has been. On our mission in Palmyra I gave of my love and my spirit. When we came home I left it there and also brought some of it home. I do not want to talk too long and make this tiresome, but there are several wonderful experiences that I would like to tell you before we close. When he went to the Church offices the next morning and it was just like it had been planned. They were there and greeted him as if they had sent for him. He laid the seven sketches out on a table and they looked them over and they too pointed to the one that the angel had pointed to. I say “angel”, I don’t know. I asked Brother Knaphus, when he told me the story, if it was the Angel Moroni that came to him. He said, “Sister Bean, that’s my secret.” But I really feel that it was the Angel Moroni who came. The placement of the Moroni statue and its dedication was a great celebration and conference that I will always remember. Willard laid a wreath at the foot of the monument which was an honor for him. Willard was able to buy for the Church, besides the Hill Cumorah, the Peter Whitmer farm and the Martin Harris farm. He came to be considered a great man out there. People came to love and respect him. They even said at a party that the Palmyra Lions Club gave for us before we left to come home, that no greater man had ever lived in Palmyra than Willard Bean. And so I feel it is worth mentioning to you that he was a great man and a great missionary. He did missionary work most of his life. He was a set apart missionary for over 40 years. Every place he went, in California, in New York City, in Tennessee, and other places besides Palmyra, he was always set apart to help the missionaries any time that he had the ability to do so. So we never know why these things happen. He had to learn all he learned about music in this life so he could pass over there and put it to good use. And now I would like to conclude my talk by telling you about the most wonderful experience that I had during those 24 years we lived at the Joseph Smith farm. It was a hot, humid summer day and we had had many visitors that day. It had been especially hard for me. I had a baby just one year old that I had carried around on my hip most of the day while I was doing my work. It was so warm and everything seemed to be going wrong. After giving all our visitors lunch and fixing our supper, night finally came. I put my children to bed and then sat down for a nice evening. Elder Talmage was there and some missionaries and we had a wonderful evening talking together. After talking for a while I took them upstairs and showed them where to sleep. Then I went down and thought, “Well, I will pick up a few things and make it easier for myself in the morning. But I was so weary and so tired that I was crying as I went about straightening things up a little. Everybody was in bed and asleep but me. I looked at the clock and it was eleven o’clock. I can remember so well saying to myself, “I had better call it a day.” I went to our room and Willard was sound asleep and our baby also. It was peaceful and quiet. I got myself ready for bed and I was still crying a little. I said my prayers and got into bed and was crying softly on my pillow. And then I had this dream or vision, I don’t know which. As we walked through the little hall into the dining room I noticed he laid some pamphlets down on a small table. We walked into the dining room and I introduced him around, and then I said, “Now you sit right down here next to Elder Talmage and I will set a plate for you.” And I thought it surprising, he being a stranger, that he and Elder Talmage seemed so happy to see each other and they talked about such wonderful things while we were eating. The spirit during the meal was wonderful and everyone seemed so happy to be together. After the meal was over, Elder Talmage said to the missionaries, “Now let’s go outside and just linger here and enjoy the spirit of this sacred place because we will soon have to leave.” I put my baby to bed and the older ones went out to play so that I was alone with this young man. He thanked me for having him for lunch and told me how much it meant for him to be there and that he thought that my children were so sweet and well trained. I felt very happy when he said that and then we walked into the hall together. He said, “I have far to go, so I must be on my way.” Then I turned from him just a moment to pick up and give to him his pamphlets that he had laid on the table. When I turned to face him it was the Savior who stood before me and He was in his glory. I cannot describe the love and sweetness that shined from his face and in His eyes. Lovingly he laid his hands on my shoulders and looked down into my face with the kindest countenance I have ever seen, and this is what he said to me. “Sister Bean, this day hasn’t been too hard for you, has it?” And I said, “Oh no, I have been so happy in my work and everything has gone so well.” Then he said, “I promise you that if you will go about your work as you have done it this day you will be equal to it. Oh remember, remember that these missionaries represent me on this earth and all you do unto them you do unto me.” As we walked through the hall and out onto the porch I remember I was crying. He turned and repeated the same thing again saying, “These missionaries represent me on earth and all that you do unto them you do unto me.” Then he started to move upwards. The roof of the porch was no obstruction for him to go through nor for me to see through. He went upward and upward and I wondered how I could see him so far away. And then all at once he disappeared and I found myself crying softly on my pillow like I was when I went to bed. I bear humble testimony to you that never again was there any frustration in my soul. Never again did too many missionaries come that I couldn’t find beds for them or enough food to give them. The great love that I always had for missionaries became even greater after what the Savior said to me. How I wish that every missionary who goes out into the world could know that His love and His guidance is only a prayer away. They teach of His Gospel and how much we mean to Him. All those years that we lived there I felt the love and influence of the Prophet Joseph Smith as did all my family and the love and influence of the Savior. I believe that if I live well enough in this life then I will meet the Prophet Joseph in the next, and that he will know me and I will know him. There will be a friendship between us that few earthly friends know. I live alone now, but I am never lonely. My days are the sunset of my life and they they are sweet and peaceful, filled with golden memories. The love that I have for all the missionaries that I have known has never diminished. The ones here in the Salt Lake area are so good to me. I was “mom” to thousands of them during those 24 years in Palmyra. I will never live long enough to thank my Father-in-Heaven for all the blessings that I have been given in my life and that are mine today. I pray that Heavenly Father will bless all of you and that all the things you hear and see and do, all the good things that add to your lives, will be stored and treasured in your hearts and minds so that when you are old like me, you too will have golden memories to make your days and nights sweet and peaceful.